Description: A wounded soldier being carried back to base on two bicycles. Before the war, cycling was already a popular past time and this was reflected in the armed forces. The Territorial Force, which was the volunteer reserve division of the British Army, was established in 1908 and contained cyclist units. 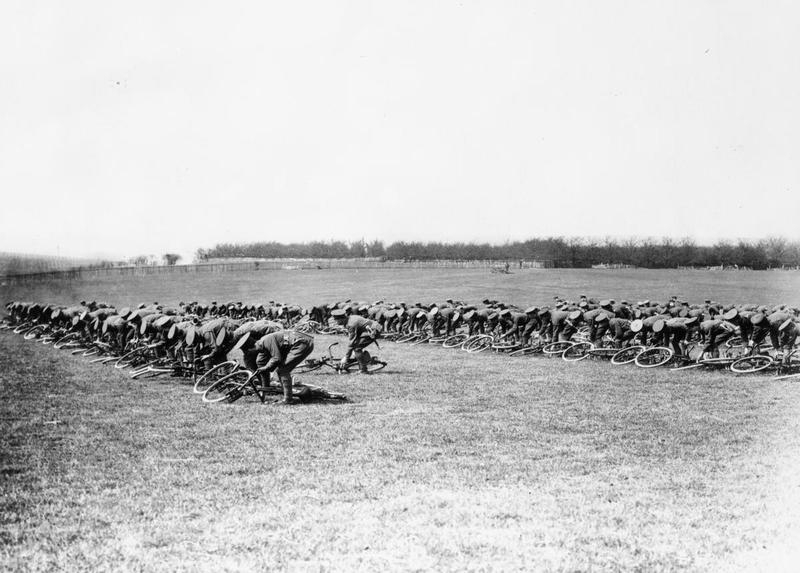 Following this, the Army Cyclist Corps was authorised in 1914 and by the start of the war the British Army had 14, 000 men in cycle regiments and battalions. These numbers increased to 20, 000 by the end of the war. As a motive to recruit volunteers, bicycles could be obtained on hire purchase, meaning they could be paid off in regular instalments. 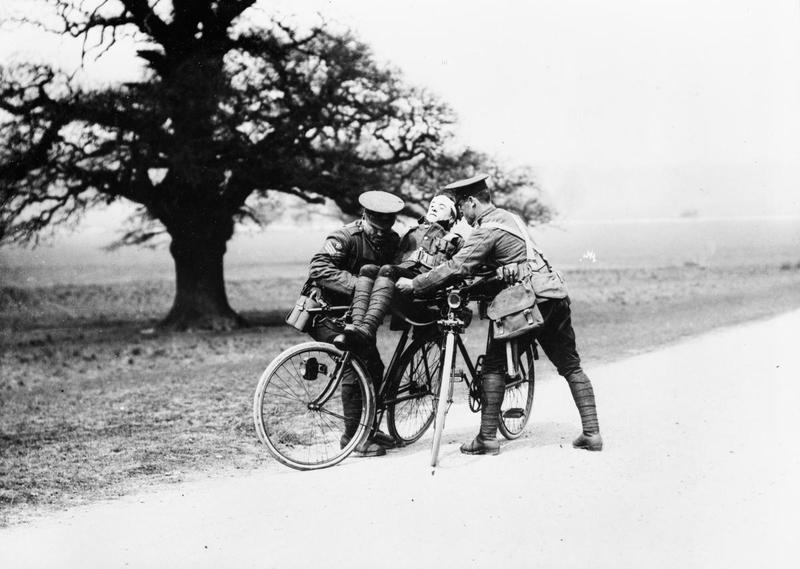 The majority of bicycles used by the armed forces during the First World War were supplied by the Birmingham Small Arms Company. As well as providing bicycles, this company also provided arms and ammunition to the British and Commonwealth armies. Initially cyclist units were used for coastal patrols on the Home Front to combat the threat of invasion. The speed and ease at which the cyclists could arrive at the scene meant they were the ideal form of transportation. This led to the first cyclist units being sent overseas to France, Flanders and Gallipoli in 1915. The aim was for bicycles to replace the outdated cavalry. As well as being quick and easy to mobilise, bicycles were cheaper, silent and did not need feeding. The range of duties performed by the Army Cyclist Corps was broad. They would carry out reconnaissance work by scouting the enemy but they could also be used to send messages, help repair communications and be used for traffic control. The Corps also formed part of the armed infantry and could therefore provide mobile firepower if required. 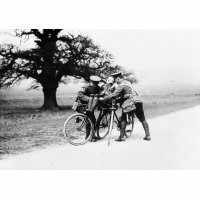 Description: Troops of the 2/1st Kent Cyclist Battalion, Army Cycling Corps. 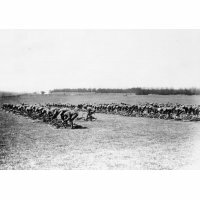 The basic designs of the bicycles (the majority did not even have gears) combined with the rough terrain ultimately reduced the impact of the Army Cyclist Corps. The increased need for conventional infantry on the front line meant the corps was disbanded in 1919. All remaining Territorial battalions converted back to standard infantry by 1922. The actions of cyclists that served in the army were memorialised not long after the end of the war. The National Cyclists Memorial was erected in Meriden in 1921 and commemorated all war-time cyclists who lost their lives. The memorial was established after public donations rose over £1100 and was attended by over 10,000 people. Written by Alex Pilch, Research Volunteer. You can read the stories of four Doncaster men who were First World War cyclists: Arthur Mewes, Joseph Piggott, William Rawson and Lewis Reeve.